The Redwing 44 is the perfect size for quick getaways, whether on the trail or in the air. Hybrid-loading U-zipper design works as both a top loader and panel loader, allowing easy access to all your gear. An additional stash pocket on the front of the pack makes it easy to tuck away a jacket or hoodie, and inside we've updated the organizers for maps, electronics, pens, and other travel essentials. The hydration sleeve is a dual-use pocket that can carry a laptop without worries. LightBeam™ single aluminum stay and Dynamic AirFlow back panel keep your load stable and comfortable. Whether your journey takes you to the streets of Chicago or the canyons of Colorado, the Redwing 44 has you covered. 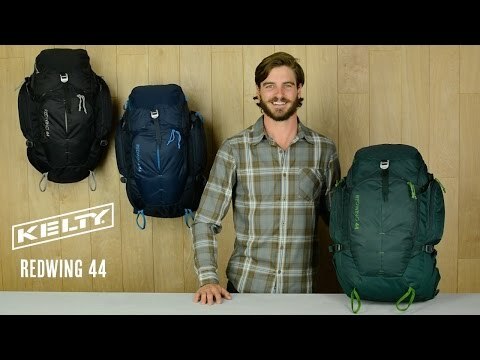 I absolutely love the Kelty Redwing and Coyote series packs for their industry leading comfort. No one else offers a pack as plush and padded as this. I own a Deuter 50L and have tried the top packs from Gregory and Osprey on week long adventures with heavy loads up to 60 pounds and none of them are as comfortable as this pack or my Kelty Coyote 80L which share identical suspension and padding designs. This pack is also quite a bit more comfortable than Kelty's own packs that do not have this plush suspension design. + The pack has well thought out pockets. + Like the attach points. The inclusion of MOLLE strips on Kelty bags is welcome. + I LOVE panel load packs. I wish the panel opening was a bit larger, but pretty nice. + Materials are adequate for semi frequent use with heavy loads. Get the tactical 44 or something tougher if you think you are going to drag around a ton of stuff each day. + Removable hip belt. Shouldn't they ALWAYS be removable? I think so. + Good styling. I like having the option to have the same look for my 80L and 44L pack. + The aluminum stay is removable. Wish the HDPE sheet was too. What could be improved to make this a more perfect product? - Make the panel load open all the way or even better, get rid of panel zipper and have a top load and a separate FRONT panel load where the opening is against your back. Good for travel security, camera gear etc. This would be a KILLER product if it had the same Kelty comfort and suspension. Just cut a hole, add a zipper, move part of the aluminum stay to the sides. Easier said than done I'm sure but I think it would sell like hot cakes since camera and security bags have awful comfort and Kelty has that figured out here. - Why won't anyone make a 20x12x9 or so 35-38L pack? This 44L is just a bit larger than ideal for daily carry or airline seat storage. The 32 and 30L packs are too small and not comfortable at all. - Replace the tool loops with MOLLE or hide them like the daisy chain. With more MOLLE points it would be easy to install tool loops if needed, and remove when not. Add some more MOLLE to the hip belt if you aren't going to give us pockets on it. - Lose the trek pole space in the side pockets. Replace with additional strap points. The holes are too small for many things, and make the bag wider and interfere with use of those pockets. - Let us remove the HDPE sheet along with the stay to pack the bag size down some for flights, etc. WORE OUT IN LESS THAN A YEAR. NOT RECOMMENDED. I love it but also, can we please get some tweaks? I bought this backpack a year ago for use as a carry-on for one bag travel. I AM IN LOVE! It has changed the way I travel. The pack is very very comfortable to carry, fits a lot more than I expected (bit more than a week's worth of clothes, travel essentials and still some room to spare) and has a lot of compartments to organize your stuff. I have not had a problem bringing it as a carry-on on in any airline (even in budget airlines with strict rules). I find that even when stuffed to capacity, it fits perfectly in overhead compartments. I bought this instead of the women's version just because of the extra 4 lbs., but still wonder if the hip belt in the other version would have made a difference in comfort. I have wider hips and wish the straps were just longer, to be able to adjust it comfortably especially if wearing several outer layers. If Kelty made this with lockable zippers (for, you know basic security when travelling) and hipbelt pockets (for easy access to things during check-in, security and boarding), I would be very very tempted to upgrade to that, and would never ever stare lascivously at another bag. I promise. My favorite day pack. This bag has accompanied me on many Pacific Northwest adventures and is by far the most comfortable day pack I've owned. At 5ft 7in, medium build, it's a great fit and very easy to adjust as loads shift on the move. With 15 to 20 pounds of gear I've had no issues with comfort and, for my build, the waist strap rides securely and comfortably on my Iliac crest. I really appreciate that the pack has plenty of organizational details and side sides pockets. As mentioned in previous reviews, external pockets can be hard to come by in pack designs these days. Great Pack, Well thought out.